We have been hearing some rumors about a bigger phablet version of the HTC One M9, Called the M9 Plus to be launched simultaneously along with the M9 at MWC 2015. It seems, though, that there will be a variant of this phone specifically for South Asian markets and it will be running on a MediaTek processor. This information comes courtesy the @upleaks account on Twitter, who also has other information regarding the phone, namely it having a fingerprint sensor and BoomSound speakers. 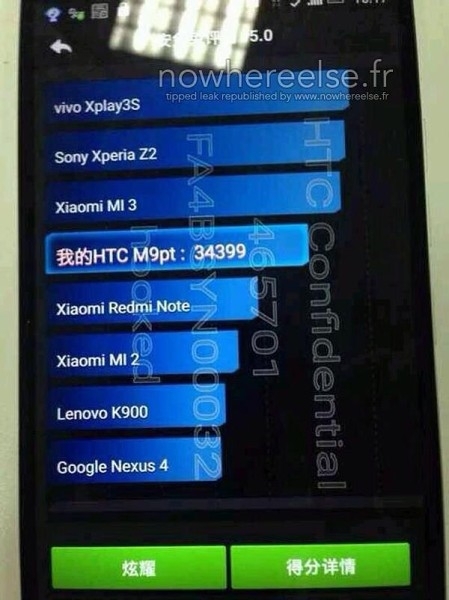 We recently saw AnTuTu benchmark screenshots of an upcoming HTC device. It was named the HTC M9pt, which according to @upleaks is not short for prototype but that the 'p' stands for Plus and 't' for TD-LTE network on China Mobile. It's for selected south asian, probably to make it cheaper. It should still have a Snapdragon version worldwide.